We are offering excellent quality of Kashmiri Red Chilli for our prestigious clients at affordable rates within an assured period of time. We are offering these products at competitive prices. Bright red color with a sweet mild aroma and a medium hot flavour. Having a positive quality management system, we are involved in presenting a comprehensive compilation of Kashmiri Dry Red Chilli. This variety of dry chilli is particularly famous for the deep-red color it adds to any dish when sprinkled during the preparation. Although it isn’t known to add too much spice to the dish, its distinct flavor is what makes it a hit among Kashmiri households. They are widely used to prepare the very famous 'pav bhaji'! In order to keep pace with never ending demands of the customers, our company is instrumental in presenting an excellent quality assortment of Kashmiri Red Chilli. Matching up with the ever increasing requirements of the customers, our company is engaged in providing Red Kashmiri Chilli. Kashmiri red chilli is Known for its hotness and smell, Kashmiri red chili lends an exquisite taste to any dish making it simply mouth-watering. Red chilis are an excellent source of vitamin A in the form of beta-carotene and are also a good source of minerals such as copper, manganese, iron, magnesium and potassium. 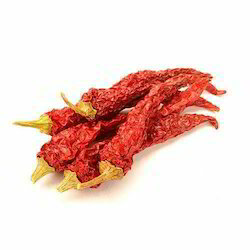 Kashmiri chilli is known for its distinctive flavour. The kashmiri red chilli is brought from the fresh farms without compromising with the quality. 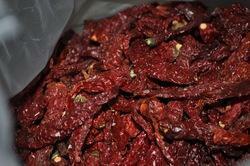 Matching up with the ever increasing requirements of the customers, we are engaged in providing Kashmiri Red Chilli.